Edit video with ease. Turn your home videos into all-time family favorites. Make them laugh. Make them cry. Let them live great moments over and over. It’s a breeze with Movavi’s timeline, with separate tracks for video, audio, and titles, simple or animated. Picture, voiceover, music, subtitles – you control it all. Process video files, music, and pictures. Movavi Video Editor supports the most popular video and audio formats. Plus, with our video editing software, you can import other graphics into your videos. For anyone getting started in 3D video shooting and editing, we have great news – Movavi does 3D video. Capture video from DV cameras and TV-tuners. Save MPEG2-TS and AVCHD video from camcorders to PC. Revive your old movie collection and family videos stored on VHS cassettes with our VHS capture devices! Record live video. Expand your soundtrack with do-it-yourself audio recordings with any sound card input – microphone, electric guitar, and more. You can also record audio directly in the video editing application. Movavi’s handy filters and special effects will take you from indie filmmaker to master director – improve the quality of your video clips or give a new perspective to a familiar image. Try the Chroma key effect – walking on water or visiting Baden-Baden can be part of your home movies. Switch from the Timeline to the new StoryBoard mode and create beautiful slideshows that combine images with music and various kinds of captions and transitions. 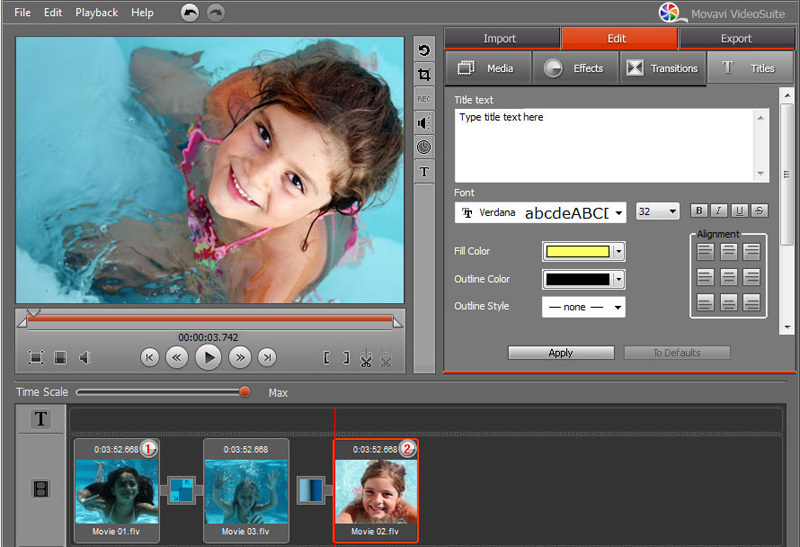 Movavi Video Editor lets you choose from hundreds of available video formats to save your video. You can edit videos and customize the format settings for optimum results on any playback device, or use the ready-made presets to save your videos for any popular media player. Export videos to your mobile device so you can catch up with all your favorite movies on the go.